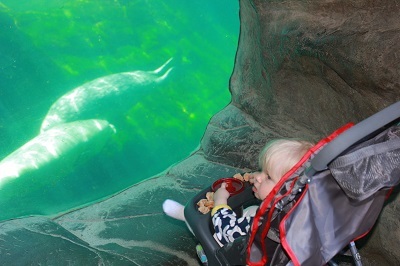 We have been enjoying the beautiful Portland summer so far with trips to the park, zoo, local aquarium, and library. 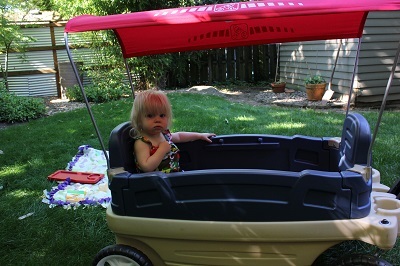 Sonya is now practicing her walking skills with assistance from mom and dad (oh, our aching backs!). She likes to walk from the living room to our bedroom, where we have a big floor mirror she can check herself out in. She is a very busy girl and never seems to stop for a moment. She is 'talking' away and loves to say 'yeah!' whenever we ask her a question. She is quick to shake her head 'no' when its something she doesn't want to do, though :) We've decided its her mission to do something funny and then watch us laugh. She is quite the entertainer. Over the 4th of July holiday, Aunt Amy and Uncle Bill came for a visit. 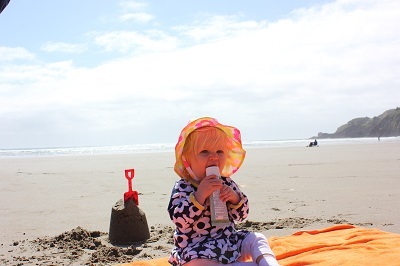 We decided to head to the coast for a weekend of relaxing (as much as one can relax with a 1 yr old). We rented a condo in Newport, Oregon, about 2.5 hours away. The view from our balcony was amazing and we only had a short walk to the beach. The weather was great, too! 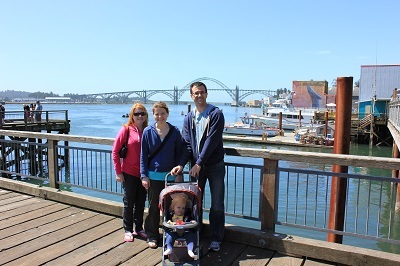 We strolled around town, saw some local lighthouses and tide pools, and visited the Oregon Coast Aquarium, where we saw sea lions, otters, sea birds, sharks, fish, and lots of other cool creatures. We had a great trip and were sad to leave such a beautiful place. Hope everyone is having a great summer so far! Fantastic photos as usual. She is just soooo beautiful!